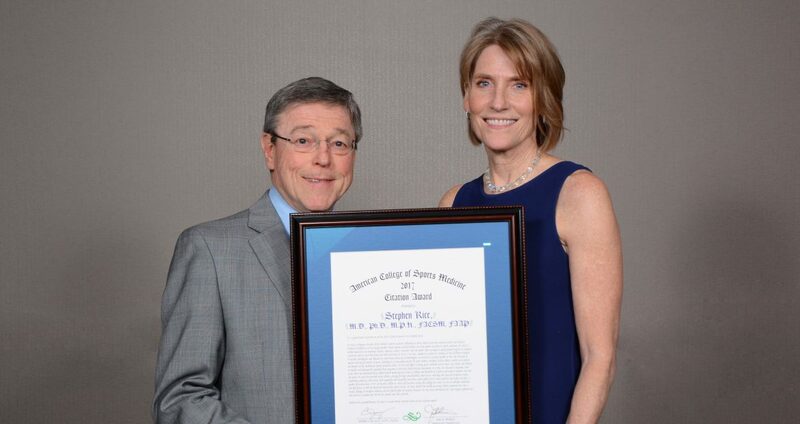 After working in pediatric medicine for more than 40 years, Dr. Stephen Rice M.D., Ph.D., M.P.H., FACSM, FAAP (Columbia, 1967) received the 2017 American College of Sports Medicine (ACSM) Citation Award — given to an individual who possesses a passion and commitment to sports medicine or exercise science. Brother Rice is the definition of dedication as he has contributed an immeasurable amount of time, effort and research into developing the practice of sports medicine and is currently the program director of the Pediatric Sports Medicine Fellowship at Jersey Shore University Medical School in Neptune, NJ. His career in medicine began in 1963 at Columbia University when he majored in chemistry and joined the Iota chapter after bonding with his suitemate, who was already a member. Following graduation, he moved on to earn his M.D. and Ph.D. from New York University in 1974. “When thinking about residency, I knew I didn’t want to do surgery. It boiled down to pediatrics or internal medicine and I loved working with kids, so I set out to Seattle.” He focused on pediatrics at the Children’s Hospital in Seattle and eventually found himself as a team physician at a local high school — where his professional career would blossom. After his residency, Brother Rice spent 20 years as a faculty member in the University of Washington’s division of sports medicine and a team physician for the University of Washington’s Huskies. In 1979, he joined the ACSM and chaired the Health and Science Police Committee for 12 years. The committee went from having no budget to becoming one of the four pillars to the organization. Brother Rice is also known for developing the Athletic Health Care System, which allows high school sports programs to better handle emergencies and prevent injuries. It quickly became the standard of care for high school athletes across the United States. In his tenure, Brother Rice has served on many committees and task forces with professional organizations, was a charter member of the American Medical Society for Sports Medicine, and has contributed to more than 100 original publications. He is one of the first nine pediatricians to be issued board certification in sports medicine. Additionally, he is the recipient of the Thomas E. Shaffer award from the Council of Sports Medicine and Fitness of the American Academy of Pediatrics for lifetime significant contributions to pediatric sports medicine. Mazel tov, Brother Rice, on your well-deserved award!